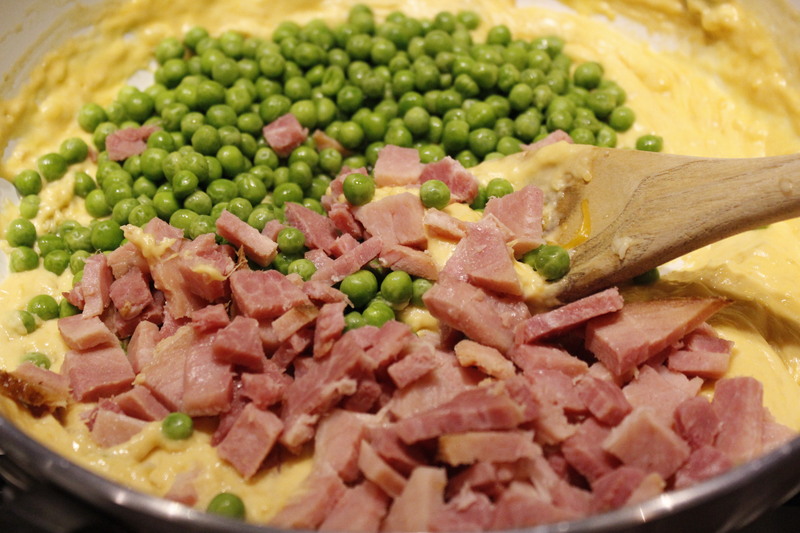 More than likely, if you bake a ham for Easter, you will have leftovers. 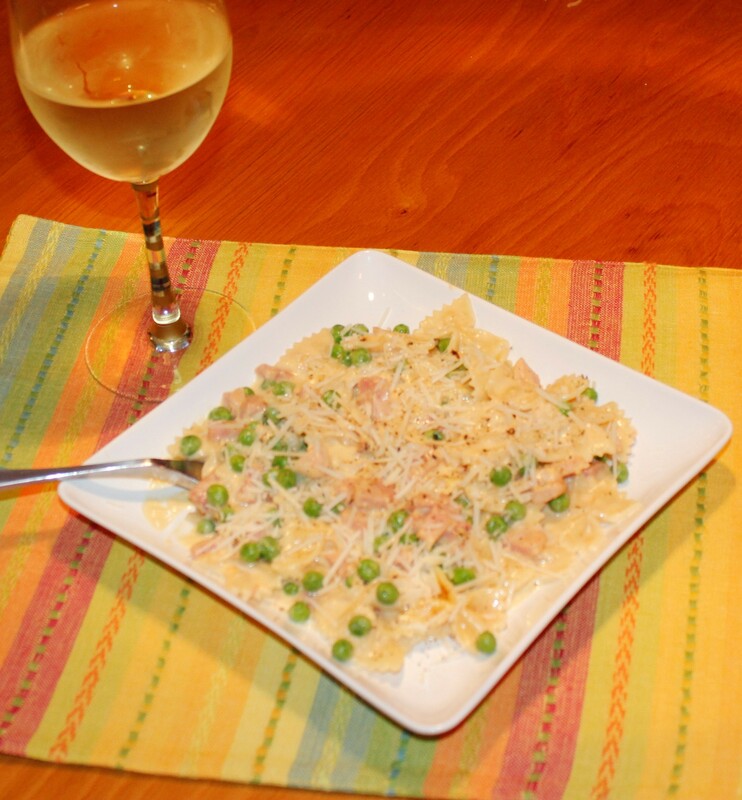 Here is a delicious and easy recipe to use up some of that ham in a most comforting way. 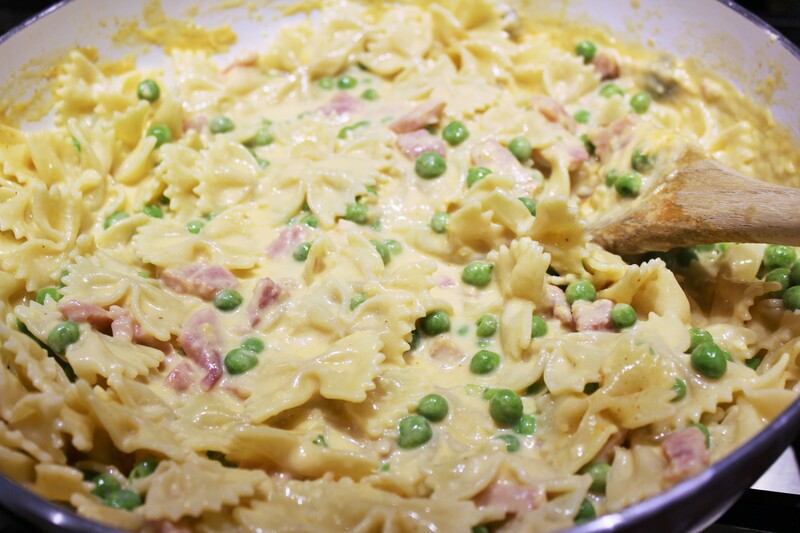 Better yet, it is based on a pasta dish from Weight Watchers® so even though it tastes decadent, using low-fat cheeses and milk make the sauce guilt-free (well, almost.) 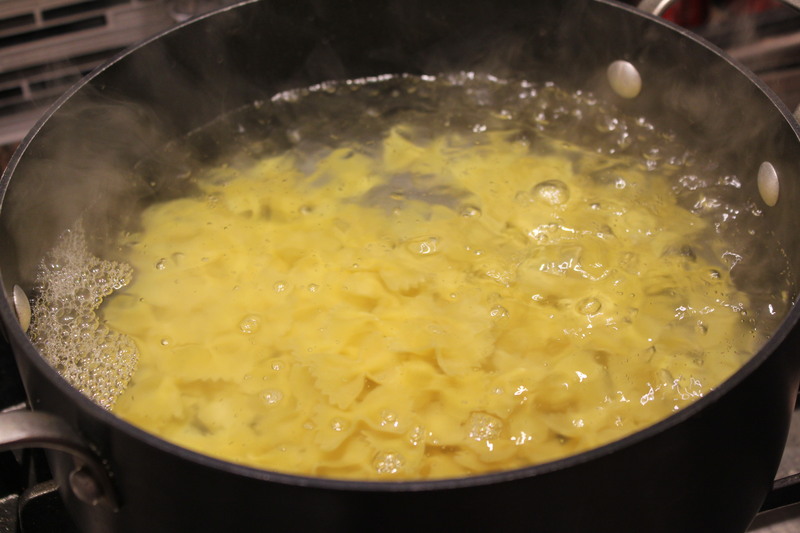 And boiling the garlic in the pasta water adds extra flavor to the bowties. I had one of those spiral hams with a brown sugar glaze, which, along with the green peas, added some sweetness to this dish. Doesn’t this look like spring on a plate? Yummy! 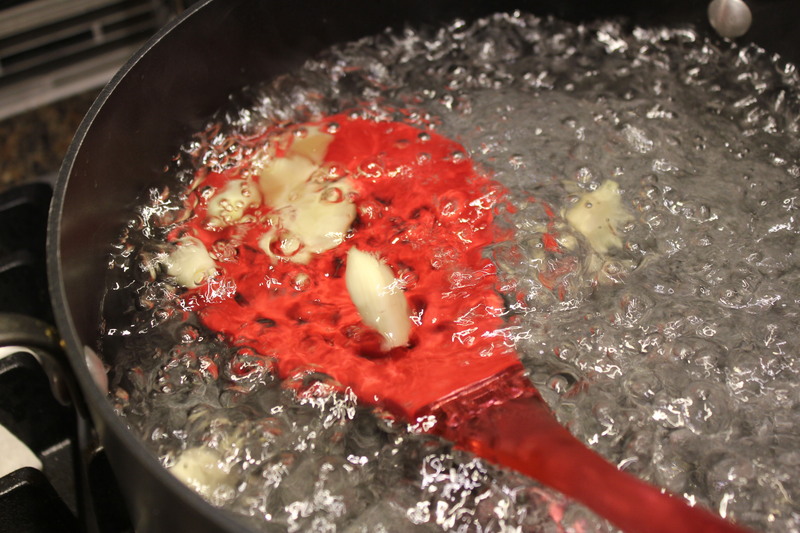 Cook the garlic in a large pot of salted boiling water for 5 minutes, until it is soft. Remove it with a slotted spoon, mince it and set it aside to use later. Add the pasta to the boiling water and cook until al dente, 10-12 minutes (or whatever the package recommends.) Drain the pasta, saving the water you boiled it in. Melt the butter in a skillet. Stir in the flour, and gradually add the milk until well blended. Cook for approximately 5 minutes, frequently stirring, until the mixture thickens. 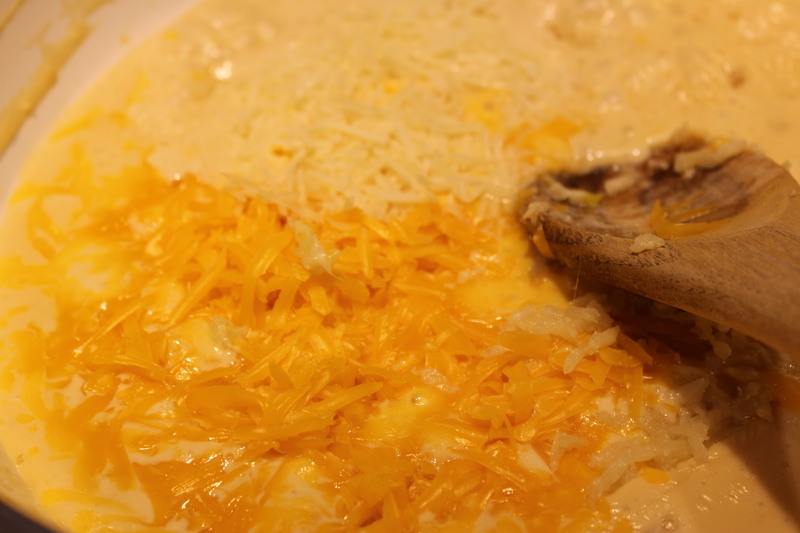 Add the garlic, cheddar and parmesan, and stir until the cheeses have melted. 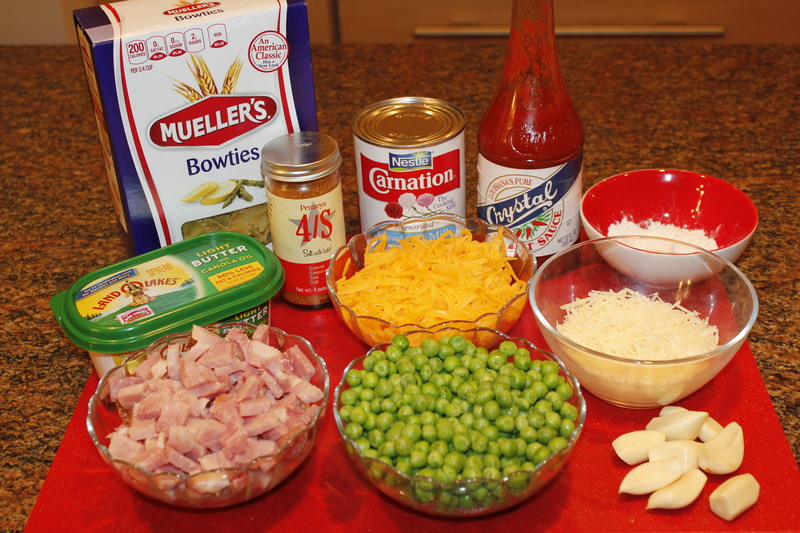 Fold in the ham and peas and blend well. Add the bowties. At this point you may need to add some of the reserved pasta water to thin the sauce. I used about ¾ cup. Season with the hot sauce and salt, and simmer for about 5 minutes. I like to top this with some grated parmesan and fresh ground black pepper once it’s plated. This pasta goes great with a glass of crisp, white wine. Or a salad, if you insist. And it reheats well in the microwave if you have any leftovers. 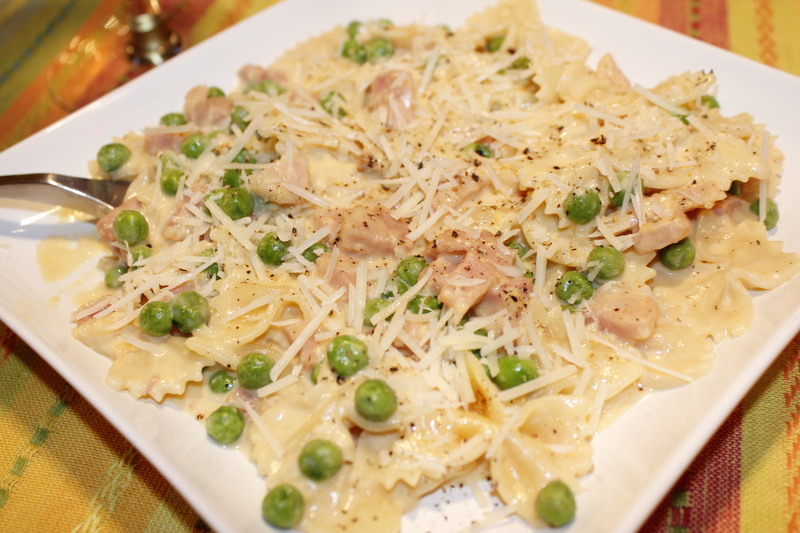 This entry was posted in Pasta, Rice, etc., Recipes and tagged eat drink and be merry, Ham bowtie pasta recipe, Kelley Chisholm recipes, leftover ham recipes, Pasta recipes, pasta with ham peas cheese sauce garlic. Bookmark the permalink. If Nina eats green beans, I would replace the peas with some steamed ones, cut into bite-sized pieces. Crisp roasted asparagus would also work, as well as broccoli florets (although I know you hate broccoli.) 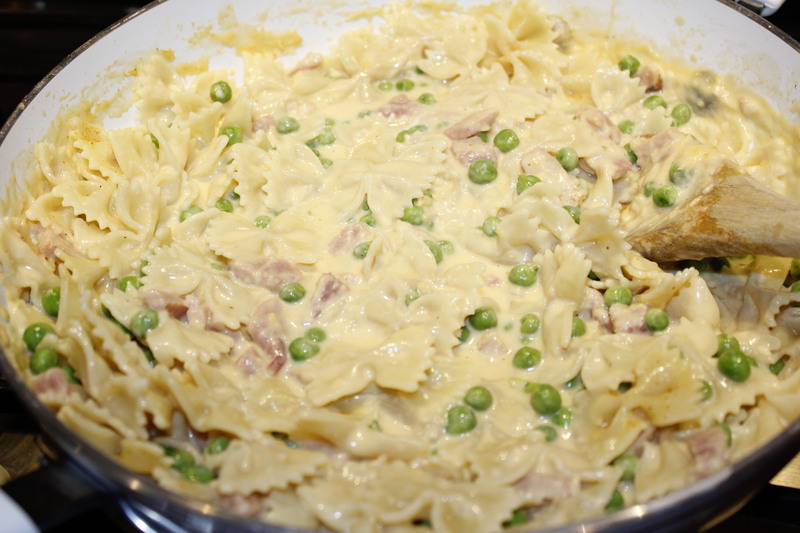 Or just replace the peas with more ham, and there you go!